Hearts will be everywhere in February. Take advantage of all the love talk to circle around to matters of the heart, including a healthy heart. Give away gift cards to employees who quit smoking on a designated day in February. It may only be one day, but if an employee is willing to try it, they may continue the trend. Quitting smoking improves breathing, blood pressure, and oxygen levels — all necessities for a healthy heart. Action step: Have employees planning to quit write their names on a bulletin board for the quit smoking day. It will bring staffers together who have a common goal in mind, and it allows accountability partnerships to develop. Encourage non-smokers to write encouraging notes on the board, too. Give away items that are cute and heart-related. A heart-shaped pen or a heart stress ball with a note of attached heart health facts are fun ways to spread awareness. 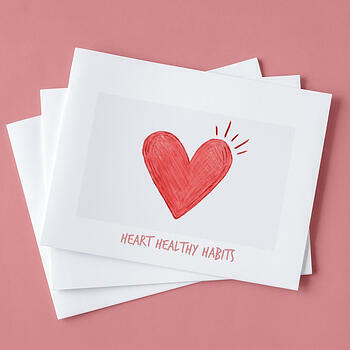 Action step: Send out Valentine’s cards with heart healthy facts to every employee. It’s an affordable and memorable way to share heart disease information. As an entire staff, dedicate one day a week to workout together for all of February. It’s a short month anyways, so even gym haters can try out working out short-term in the name of a healthier ticker. The habit may even turn into an activity they enjoy instead of loathe. Action step: Ask an employee to coordinate each week’s physical fitness activities. It doesn’t have to be expensive. Head to the local park for a walk, or set up a Stairmaster challenge within your company’s stairwell. Raise awareness about heart disease by wearing the color red. Every Friday, have your entire staff wear various shades of red. Action step: To get into the team spirit, have shirts created with facts about heart disease on the back of the T-shirt. If you host a fundraiser to donate proceeds to a foundation like the American Heart Association, wear your shirts during the event to spread additional awareness. The more you share, the more people will learn about heart disease and its lasting impacts on health. Knowledge is power, and the more your employees know, the better off they'll be. Action step: There are plenty of ways to get the word out. Share heart health facts in your monthly newsletter. Use #HeartMonth to tweet about American Heart Month on your company account. Host a cardiologist for a lunch and learn, and provide a heart-healthy meal catered by dieticians. Serious topics don't have to be boring. Bring some heart to your American Heart Month awareness campaign, and employees are unlikely to forget the importance heart health. All five of the ideas to celebrate American Heart Month above are doable for companies of any size. Early action is critical for heart attack victims, and knowing the warning signs increases the chances of survival when emergency treatment happens fast. By sharing details like warning signs and symptoms and prevention measures, you’ll give your employees information that could one day save their life. How do you plan to promote American Heart Month activities in your office? Share your ideas below!